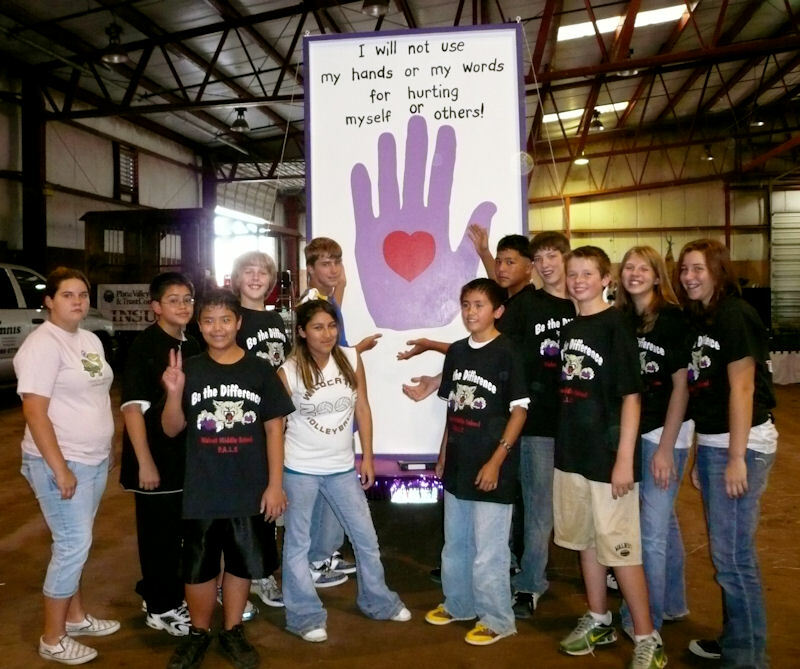 Students prepare Hands & Words float for "Harmony of Harvest" parade October 2007. Thousands gather from all over the state in Grand Island to watch the annual event. June 2005, Operation Respect & the Don’t Laugh At Me Program selected Walnut Middle School, Grand Island, Nebraska as one of five schools in the United States and Canada to receive recognition as a model for positive change in schools. On June 30-July 1, 2005 at Operation Respect’s national symposium in Washington, D.C. representatives from Walnut Middle School presented their results which highlighted the Hands & Words Are Not For Hurting Project. Participants included national and state education organizations, leading government officials, educators, and researchers. The goal of the symposium was to demonstrate conclusively that schools can transform their environment. State Sen. Ray Aguilar (left) and Grand Island Police Capt. Pete Kortum sign pledges that say, "I will not use my hands or my words for hurting myself or others," at Walnut Middle School. Grand Island school a bully-free zone: Purple hands on the office window are one component of the successful anti-violence program at Walnut Middle School in Grand Island. The 2003 National Schools of Character Award was presented to Walnut Middle School in Washington, D.C. in October, 2003. Ten schools (K-12) in the nation were honored with this award. Walnut Middle School is the only middle school to be selected. CONGRATULATIONS! Each year, Character Education Partnership (CEP) selects schools and districts from across the country that demonstrate outstanding and successful character education initiatives. The CEP is a nonpartisan coalition of organizations and individuals dedicated to developing moral character and civic virtue in our nation’s youth as one means of creating a more compassionate and responsible society. This entry was posted on Wednesday, July 23rd, 2008 at 3:38 pm	and is filed under Featured Models, Home, Middle, Schools. You can follow any responses to this entry through the RSS 2.0 feed. You can leave a response, or trackback from your own site.